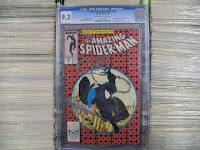 Amazing Spider-Man #300 has the first appearance of Venom. This comic book has now become a bit "hot" since the new movie will have Venom make his movie debut in it. We had one graded a while back, figuring we'd sell it once the movie got closer. Well, it's getting closer and Craig has been on a bit of an eBay kick lately, since he discovered and downloaded an auction lister called Auctiva. Anyway, here's our listing if you want to see how it ends up.